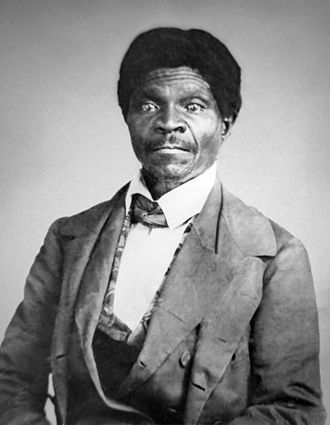 On May 26 of 1857 Dred Scott got his freedom. The wrong way. Too late. But there is some small comfort in the matter despite the horrifying backdrop. Scott was, of course, the slave plaintiff in the most important case in American judicial history and the most disastrous and judicially preposterous ruling the U.S. Supreme Court ever made. And I say that in full awareness of Roe v Wade. The case wound its tortuous way through Missouri state courts. But here’s one weird thing: Scott’s lawyers were paid by Peter Blow’s children, who had turned abolitionist. Ultimately he lost due to very doubtful rulings. But by 1853 Scott was owned by Irene’s brother, John F. A. Sanford, who resided in New York while Scott if free would reside in Missouri so he was now able to sue in federal court. (That’s why the Supreme Court case would be Dred Scott v Sanford except for a clerical error that made it Scott v Sandford). By now Blow’s children were tapped out for legal fees. But Scott found lawyers willing to take the federal case pro bono. And meanwhile, the second weird thing, Irene Emerson had married an abolitionist named Calvin Chafee, who on subsequently being elected to Congress was attacked for hypocrisy because of owning Dred Scott. He responded that neither he nor his wife knew anything about the whole business until it hit the headlines and then wrote to one of Scott’s lawyers to ask if his wife could free Scott. Here’s the third weird thing. It somehow turned out that Sanford never really owned Scott. So Mrs. Chaffee did still own him and his family, and she gave them to Peter Blow’s son Taylor so he could free them. Regrettably Scott died of tuberculosis 16 months later. And the whole thing is an appalling mess, from the institution of slavery itself to the Taney court’s wretched judicial overreach in defence of it to the slaughter necessary finally to end it to the aftermath of bigotry and segregation. Yet in the darkness this much light does shine: not only Peter Blow’s children but Irene Emerson were converted to the anti-slavery cause and actually tried to do something about it. It’s amazing how many otherwise decent people never did grasp the to us overwhelmingly obvious wrongness of human servitude. And not enough people saw the light to prevent the Civil War, or indeed to abolish the “peculiar institution” decades earlier. Scott got his freedom the wrong way, and too late. But he did get it, from individuals whose hearts were changed. And that is some small comfort.